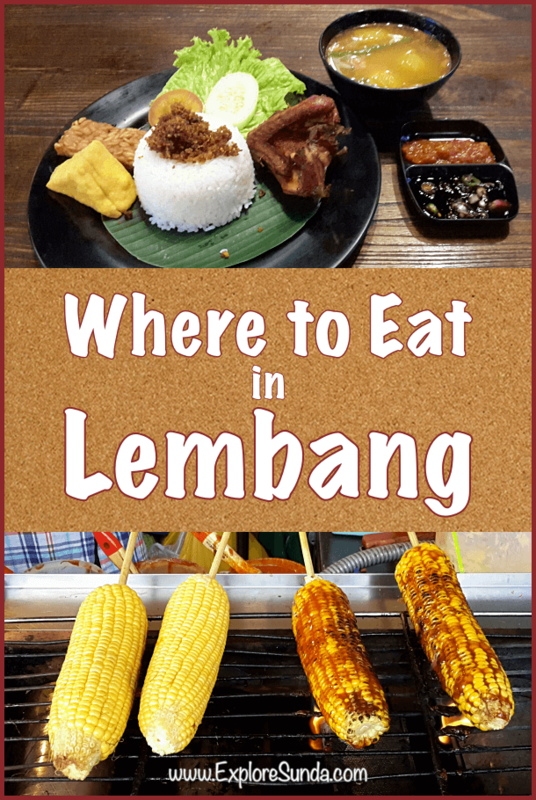 Where to Eat in Lembang? First, is the foodcourts and restaurants inside the places of interests. Usually they don't allow us to bring any food and drink from outside, hence, our choices are very limited. Luckily, there are many independent restaurants scattered around this town. Most of them serve Sundanese food, but some also serve Chinese food. Being in the highland, seafood is not common dishes here. 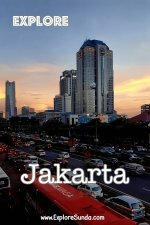 We, at the ExploreSunda.com, has compiled a list of recommended restaurants around this town. On top of that we also cover special food and drink you can only find here. The downtown has many small restaurants offering various cuisines, such as Sundanese, Chinese, and noodle house. Should you crave for Chinese food, Mandarin restaurant is the best. The location is right in the center of the town. 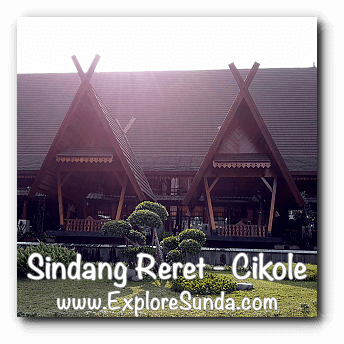 Although there are several Sundanese restaurants here, our top recommendation is still Sindang Reret restaurant and hotel. The location is in Cikole, near mount Tangkuban Perahu, approximately 15-30 minutes drive from downtown. 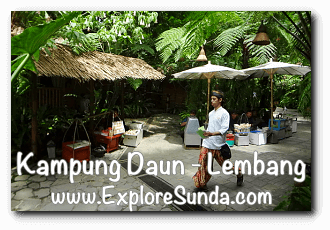 This restaurant specializes in Sundanese cuisines such as fried and grilled gourami fish as well as chicken, gepuk (grilled beef) and karedok (the Sundanese salad with oncom sauce). The food are delicious and the place is cozy. We can choose to dine in the saung (a gazebo where we sit on the floor with coffee table) or on the dining table. But if you are lucky you can dine in a boat! 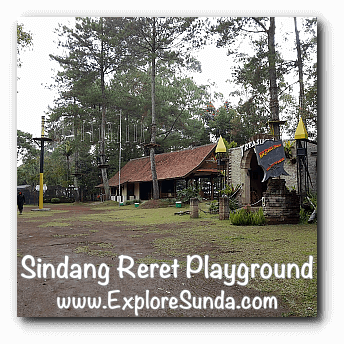 Sindang Reret is more than just a restaurant. It is a combination of hotel, restaurant and playground in one area. There are several games offered in the playground, such as ATV rental, horse riding, and walking on a high rope. 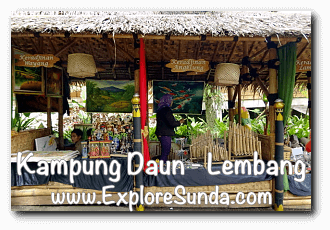 Kampung Daun is located in Trinity Residence in Cihideung village. The lay out is unique, most of the dining areas are in the shape of small gazebos (saung), uphill following the contour of the land. 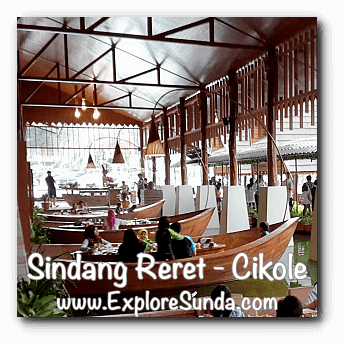 It is a Sundanese restaurant offering typical Sundanese cuisines, similar to Sindang Reret. In addition, many traditional snacks are sold on the path. So, it feels like we are in a small village. Often there are traditional dances perform on the open air stage. The number one specialty snacks since forever are grilled sticky rice and grilled corn. 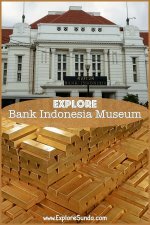 You can find them in the pedestrian walk in downtown or on the way to mount Tangkuban Perahu and Ciater hot spring. The sticky rice is cooked beforehand and cut into cuboid. The seller will grill them upon order. Usually we eat them with sauce. There are 3 sauces available: peanut, fried coconut shreds, and oncom. You can choose one of them or mix it. The oncom and peanut sauces are a bit spicy, while the coconut shreds is neutral. Although the process and the look are the same, the taste is slightly different between the stalls. Our recommended vendor is the one in front of Pulau Mas restaurant. Since they are at the pedestrian walk, each seller usually only has one bench. 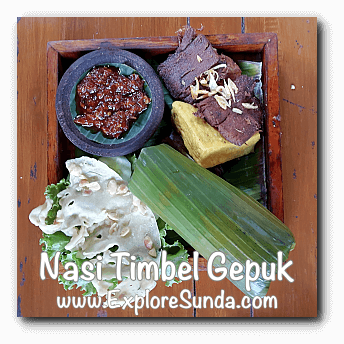 If you want to eat the grilled sticky rice and corn as well as hang out, you’d better try the small eateries on the way to mount Tangkuban Perahu. It is only 10 minutes drive from downtown, on the right side of the road. 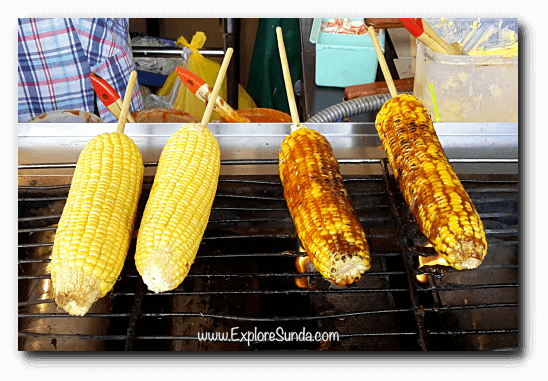 However, our favorite place to eat grilled corn is in front of Gracia spa. It is a bit far from Lembang, near Ciater hotsprings, which takes about 30 minutes drive, but it has beautiful view of tea plantation in the background. Another favorite snacks are tempe chips and oncom chips. The shop is in the front row of the fruit market in the main road of the town. You will not miss it since it has two giant wok pan that can be easily spotted from the street. Although the price is a bit expensive compare to other traditional market, they are still cheaper with higher quality compare to the ones in supermarket. Here you can find fresh avocado, tomato, broccoli, carrot, pumpkin, orange, and many more. Most of them are locally produced. 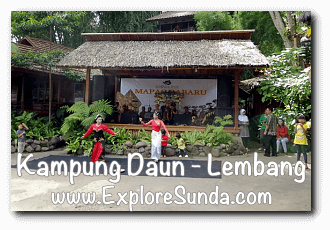 Lembang is also famous as an important milk producer in Sunda. You can buy fresh milk and yogurt in the North Bandung Milk Cooperation (KPSBU). You can drink the yogurt right away, but the milk must be pasteurized (warm it up until 70 degree Celsius) first. The location of KPSBU is right behind the traditional market. Alternatively, you can buy frozen yogurt at Cijeruk street, near the intersection of the traditional market. The specialty of this shop is mixing fruits such as strawberry, grape, lychee, mango, etc into the yogurt. It is really delicious. Unfortunately, the shop only sells frozen yogurt (literally frozen like ice cubes) and there is no place for dine in. Here you can also buy various flavor of popsicles. We call them mambo ice, made of coconut milk and fruits. There are various flavors available, such as avocado, coconut, mocha, chocolate, strawberry, mango, blackberry, and black sticky rice. So, whenever you come here, don't forget to bring your cooler. Alternatively, the owner will wrap your ice with newspaper. Usually they will still be frozen for an hour or so. In addition to the list of restaurants and snacks above, every places of interest in Lembang usually offers various kind of food. 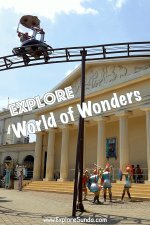 Have you explored them?